With an a great skill as a boy, Thomas Gainsborough begins to study art formally at 13, starting with his first landscapes, which was the motif he liked the most. Some years later, he gets married and, as his landscapes were not selling, he had to move and started to paint portraits. Clients called him and, with an arranged fee, he would portray them. So to speak, his art was his job. Like that continued Gainsborough, trying to socialize with the upper class in order to get more work and, of course, more Money. He even had the chance to portrait some “celebrities” of that time, like the duke and duchess of Cumberland. In this period, his portraits were generally full body and he paid great attention towards the details. The suits and dresses he painted were much admired among the upper class. 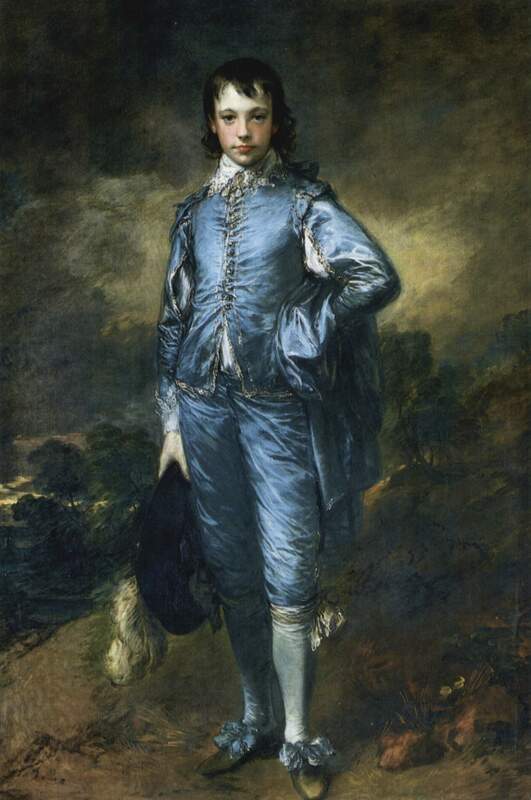 Regarding Blue boy, it is believed that it is the portrait of Jonathan Buttall, son of a wealthy merchant, although this never has been proved. What it is certain is that the painting remained in the Buttall family until 1802, when it was sold. After that, it was sold and bought many times, and found its home in the Huntington Library in California, place where it still is. It also believed that, throughout this painting, Gainsborough answered his rival artist, Joshua Reynolds, who wrote: “It ought, in my opinion, to be indispensably observed, that the masses of light in a picture be always of a warm, mellow color, yellow, red, or the green colors be kept almost entirely out of these masses, and be used only to support or set off these warm colors; and for this purpose, a small proportion of cold color will be sufficient.” In The blue boy, light and the blue of the suit of the little one are completely cold, contradicting Reynolds theory. Sadly, poor Gainsborough was famous for doing something he didn’t like: even now he is acknowledged as one of the best portrait painters of the 18th century. ~ by Álvaro Mazzino on September 6, 2010. An anatomically contoured energy foam sockliner provides cushioning, as it evenly distributes weight, and the Grand.ØS dynamic energy foam outsole freely moves with the natural motion of feet. This entry was posted on September 6, 2010 at 09:27 and is filed under Rococo.You can follow any responses to this entry through the RSS 2.0 feed.You can leave a response, or trackback from your own site.